2014 was an important year for truckers. Here are some of the highlights that made truck driving a great career in 2014. Many of the country’s largest retailers released ad campaigns in 2014 to advertise new compensation packages for skilled drivers. Wal-Mart was one of the larger advertisers, offering qualified drivers with CDLs a $76,000 salary plus benefits. This is a significant increase, as average annual pay for drivers in 2013 was under $50,000, up roughly 28 percent from around $39,000 in 2000, according to data from ATA and the U.S. Bureau of Labor Statistics. Driver pay skyrocketed in 2014 and is expected to continue to climb in 2015. Learn more. The trucking industry added thousands of new jobs to the American economy in 2015, but demand is still very high for skilled drivers. As the economy picks up speed, there’s a greater need for truckers. As people start spending more money, there’s additional freight to move, and skilled drivers are needed to move it. Several of the largest long haul trucking companies in the U.S. are currently hiring. Those companies include Swift Transportation , Schneider National, J.B. Hunt Transport Services, and Werner Enterprises – all of which are currently aggressive hiring drivers. Learn more. Both truck engineering technology and the incorporation of technology like mobile apps have pushed the needle on new technology meant to help drivers. Peterbilt introduced password protected trucks – drivers enter the password into a 5-inch screen on the instrument panel, within the driver information center. After the code is entered, the engine must be started within six minutes, or the code will need to be re-entered. The “Weigh My Truck” App allows drivers to weigh their truck, have weights displayed on their smartphone, and pay for the transaction within the app via PayPal, all without ever having to leave their vehicle. 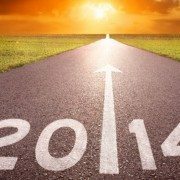 We’re looking forward to seeing what new technology will be created to help drivers in 2015! Now is a great time to earn your CDL at Progressive Truck School! Apply now. Driver compensation is on as a steady increase as the demand for skilled drivers increases. Retailers and trucking companies are offering increasingly high bonuses, annual pay, and benefits packages to attract truckers to their fleet. Now is a great time to earn a salary that is significantly higher than the national average. You can learn more about driver pay here. People spend obscene amounts of money to travel around the United States. Truckers are able to see some of the best sights and experiences in the United States, while being paid for it. Even places that are less-frequented by travelers, or that tourists haven’t heard of can be breathtakingly beautiful from the open road. 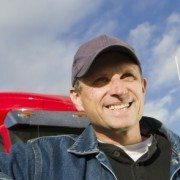 You might travel across a state multiple times as a trucker and notice something that you never have before every time – truckers are able to see the United States under a unique lens. The value also extends to educating yourself about the geography of the United States – there’s no better way to learn about the various locales in our great country than the experience provided by trucking. There are few occupations as flexible as being a truck driver. Let’s say you want to move to another area of the country. With most companies, this isn’t an issue. If mobility is your thing, trucking is a great way to be able to change locations. With skilled truck drivers being in such high demand, finding a great job in a new city right now is not terribly difficult. Also, you will find that time-off flexibility is also a great perk. With many companies, you simply request time off when you need it and it’s granted. One of the little talked about, but great perks of being a truck driver, is the ability to reflect. If you’re the type of person that enjoys solidarity and alone time to reflect, trucking can provide this for you. Even for non-introspective people, the experience of driving around the country, seeing the sights, and having the ability to reflect on life and the future is a great perk not often offered in other careers. Are you interested in building a nest egg, or a significant amount of money that you can save? Many drivers don’t even buy a house. They save the rent or mortgage money, bills, and other sizable expenses that come with owning or renting, and put that into a savings account. Expenses incurred on the road are typically much less than the type of day-to-day expenses incurred by say, office workers. Trucking can be a great way to save money and build wealth. Interested in CDL training? Click here to apply. In an amazing feat of trucking technology, Daimler has released its Future Truck 2025, a truck that can drive itself while allowing its driver can be much more productive and safer behind the wheel. The truck is designed to constantly communicate with surrounding vehicles and objects to allow multiple vehicles to travel closely together. The truck is even smart enough to anticipate necessary maintenance and repairs. 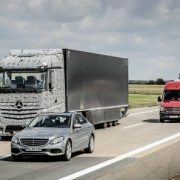 The world premiere of the self-driving truck was recently made on a new section of the Autobahn near Magdeburg, Germany. The tractor trailer combination was put through a series of real-world driving situations including interspersed traffic and multiple speed tests and test including getting out of the way of emergency vehicles. The vehicle passed the tests, responding smoothly to the tests without requiring any driver interaction. The truck features many significant advances in trucking technology, including the artificial intelligence-like Highway Pilot assistance system, which operates very much like an auto-pilot system in airplanes. In addition to this technology, the truck also features an innovative computer and sensor system including advanced onboard data processing and communication tools and advanced driver assistance systems such as adaptive cruise control, collision avoidance, and blind spot monitoring. Especially interesting for our Progressive Truck School graduates might be the improved driver’s experience including the ability to relax and switch to autonomous mode, accessible through a button on the armrest. The actual driver’s seat moves backwards and pivots up to 45 degrees for an optimal seating position, which allows enough room to stretch out like you’re sitting in a recliner. The driver will always be in total control of the cab, as any manual steering, braking, or accelerating will override the auto-drive technology to give control back to the driver. Now is a great time to join the trucking industry as a driver! Apply here. 1. Look at their track record. First and foremost, look at the track record of the school. How many commercial driver’s licenses have they issued? A school that advertises that they’re the “best driving school in Chicago”, but doesn’t have an establish track record of helping students to graduate and find jobs is a school to avoid. At Progressive Truck School, we’ve graduated over 50,000 students since 1974 – those are the types of numbers you should be looking for when selecting a school. Also, look at the testimonials on the school’s website and social media. Look carefully at what students say about the training and professionalism of the staff. Avoid schools where you aren’t able to find feedback from former students. 2. Check out the equipment they offer to students. Does the school offer late-model conventional and cab-over tractors, day cabs and sleepers, with single and double axles and various transmissions, as well as different brands of vehicle, so you get an all-around training experience? Also, what does their training terminal/lot look like? A school without a dedicated, large training terminal and parking lot is typically a CDL school to avoid. Also, look for a school that offers on-the-road training, so that you can get real-life experience. 3. Find out if they offer job placement assistance. Does the school you’re considering offer Job Placement assistance? The last thing you want to be is a CDL graduate without a great job to jump-start your career. Look for schools that have experience placing students with top companies. At Progressive Truck School, we assist students to get jobs at companies like Schneider National, Werner Enterprises, FedEx, Roehl, and Con-Way. Also, look for CDL schools that offer job placement assistance free of charge! 4. Find out if they offer PTDI-accredited courses. PTDI is the first nonprofit organization to develop uniform skill performance, curriculum, and certification standards for the trucking industry and to award course certification to entry-level truck driver training courses and motor carrier driver-finishing programs. Look for a school that offers classes that are certified by PTDI. PTDI is a great indication that the trucking school is recognized on the national level for meeting the PTDI’s high performance standards. 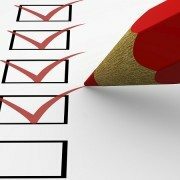 By taking these four factors into consideration, you are well on your way to finding a great truck school for your CDL certification! To apply to Progressive Truck Diving School, complete this form.